This vibrant salad is bound to be a crowd pleaser and looks impressive without the effort. 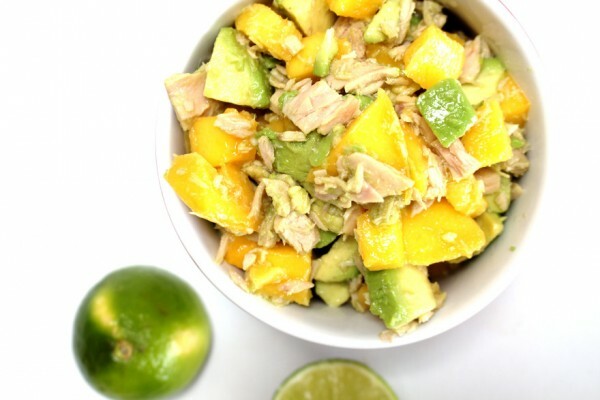 All you need is a ripe mango, a ripe avocado, a juicy lime and some good quality tuna. I was so delighted recently to find a new, wild tuna in extra virgin olive oil on the shelves. The brand is “shines” and I highly recommend it. For years when I was growing up, I said I hated tuna. That’s because the only tuna available was John West brand in either brine or sunflower oil. When I first tasted good quality tuna in Italy drenched in a delicious olive oil, I was blown away. Proof that the quality of ingredients really does matter. Sorry, John West, nothing personal! My local health shop has started stocking a delicious Spanish tuna as well now called “Ortiz”. A little on the pricey side but well worth it. Tuna has become one of my convenience foods since starting SCD as it makes a great, quick lunch if I’m in a rush. I certainly don’t overdo it due to the high mercury content but once or twice a month it saves my life. 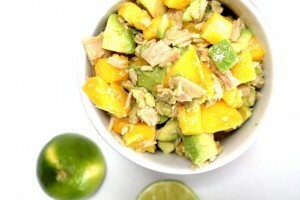 Tuna, avocado and mango salad might seem a little out there but it works, trust me! As the avocado tends to turn brown quite quickly, make this just before you serve. I have tried all the tricks at the stage: leaving the stone in, squirting with lemon or lime juice. No matter what, my avocado left overs always turn brown. If you have a trick that works for preserving them better, do enlighten me! 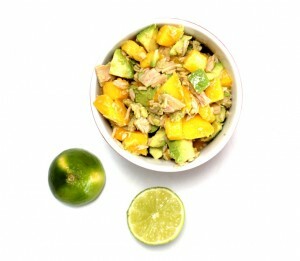 A deliciously refreshing and healthy tuna, avocado and mango salad. Gluten-free, grain-free, refined sugar-free, Paleo and Specific Carbohydrate Diet (SCD). Chop up the mango and avocado and place in a bowl. Flake in the tuna. Mix all the ingredients for the dressing well and add to the salad.